Mylopotas beach in Ios. Hotels. If I were going to do a top ten of the ten most beautiful beaches in Greece, Mylopotas would come high on that list. The view of the beach is so aesthetically attractive that one have to rub one's eyes. Mylopotas is for me the mindset of how a perfect beach should look like. 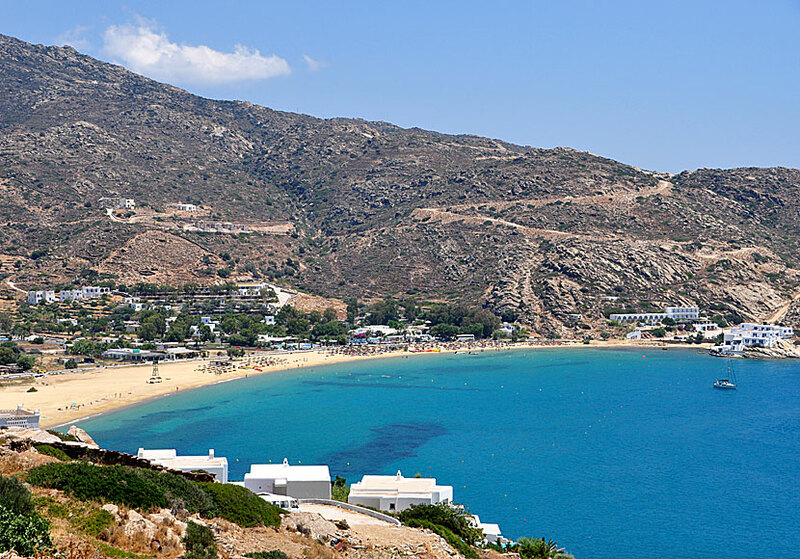 It takes about five minutes by bus from Chora to the beach, and around 20 minutes to walk. I prefer to walk so I can enjoy the amazing view as long as possible. View of Mylopotas beach and the beautiful surroundings. Chora to the right. The beach is about 1 kilometre long and is covered by light brown sand, in its places mixed with fine-grained gravel, mainly at the beginning of the beach. At the far end it is fine-grained sand. There lies the young crowd's paradise, Far Out Village, which attracts young people from all over the world. Far Out Village is like Ios' Mecca. If you like a bustling beach life, you do not have to go anywhere else in the world. Many people stay here their whole holiday. One do not even have to go to the beach when staying at Far Out Village, there are several swimming pools, bars and restaurants, mini-market, billiards, laundry, water toys, internet and anything else you can imagine. Of course there are all types of accommodations as well. Far Out Village is paradise - if you belong to the right target group. Opposite Far Out Village - where the beach ends - lies a fish taverna named Drakos. The taverna has been here from time immemorial, or at least since the seventies. Then there was no road to Drakos, you had to go by boat or to trudge through the sand. It did not stop people from coming. Drakos is still popular among locals. It's almost impossible to get a table on Sundays. If you want to eat fresh fish, you should do it here. They even have an employee who clean the fish. Do not miss. 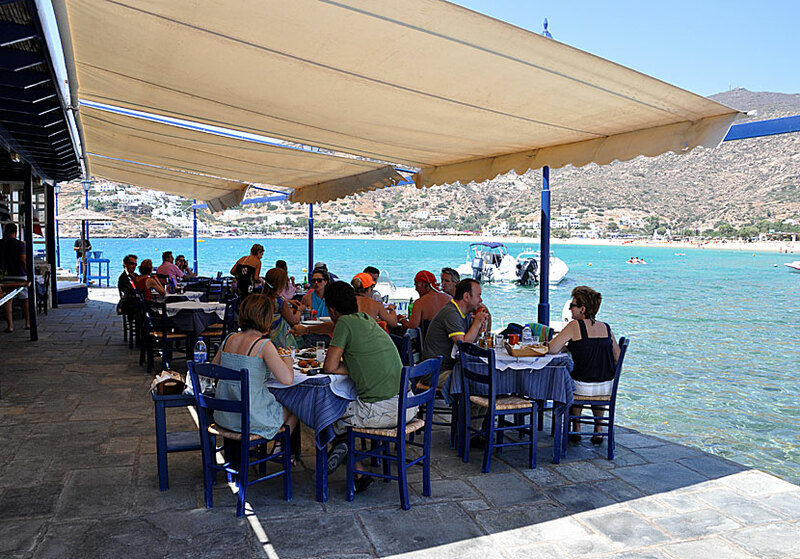 Drakos Taverna at Mylopotas beach. Most tourist amenities, such as shops, hotels and pensions, are located at the beginning of the beach. Here lies the Ios Palace Hotel, a rather luxurious hotel, which was strongly questioned when it was built. Who on earth wants to stay there? Who wants to swim in a swimming pool so close to one of Greece's best beaches? Many it appeared. The Ios Palace Hotel was like a trendsetter, today there are several hotels with the same or higher standard. If you go to the right of the hotel you will come to a bathing-place with rocks. At the far end lies Restaurant Harmony that has been extremely popular for many years. If you choose to go on foot to Mylopotas (which I recommend), you will see a mythical villa by the sea (see picture below), a few hundred metres before you turn into the path to Mylopotas. It's a beautiful house with a location that makes you drool. I do not know who lives in the house today, nor who have lived there. The view of Mylopotas beach which you can enjoy if you walk to the beach. 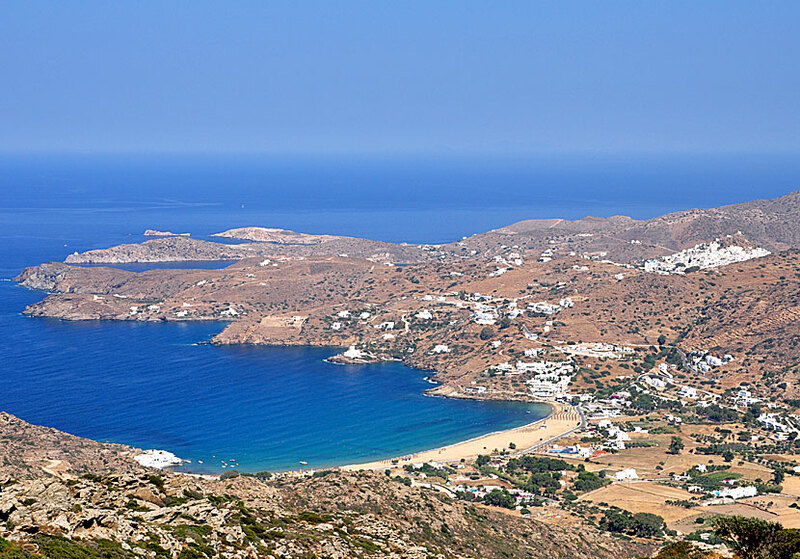 If you want to stay close to a beach, and think that Mylopotas is too trendy, it's very nice to stay in the port, or between the port and Chora.